How do I make my room reservation? To make reservations, please use our secured online reservation form available on this website. Please ensure that all required fields are filled as specified on the reservation form. Q2. When I submit my reservation form, where does my request go? It will go directly to our Reservation Department. How long does it take the hotel to respond to my reservation request? Response is immediate once the reservation form is sent. However, if you do not receive any response within the hour, please email to reservation@hotelroyal.com.sg or duty manager@hotelroyal.com.sg for our follow up. reservation has been accepted with a confirmation number. Reservations are deemed secured and confirmed without any credit card guarantee. However, we would appreciate if you could furnish us with your expected arrival time or email to us if there are any changes of plans to stay with us. What happens if I encounter problem with my reservation upon checking-in? It would be advisable to quote your confirmation number or present a copy of the reservation form upon check-in to the reception. Alternatively, you may mention your name or the name of the person reserved as reference upon check-in. Would I be charged for any cancellation should there be any changes in my travelling plan? Should you have any changes in your traveling plan, do email to our reservation department at reservation@hotelroyal.com.sg or you can simply call our hotel’s main telephone number at 65 64260168 to make the necessary amendments and we will accede to your request as best as we can. Do your hotel accepts credit cards and what type of credit card type do your hotel accepts? Yes, our hotel do accept all major credit cards, such Amex, Visa, Mastercard, JCB & Diners. Q8. How many rooms & suites are there in Hotel Royal? There are altogether 331 suites and rooms in our hotel. Do you have any Family Rooms available for a family of 2 adults & 2 small children? Yes, we do have more than 150 Family Rooms available. 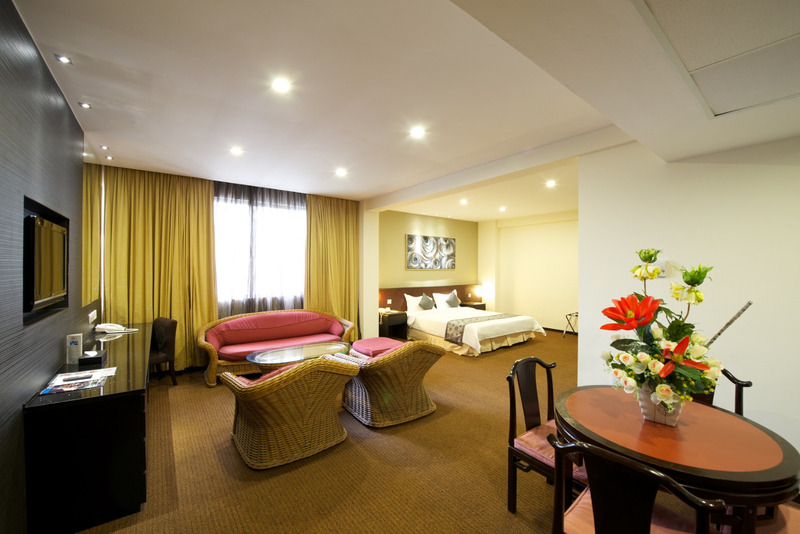 Our Family Rooms are very convenient and comfortable for families sharing a room. Q10. Does your hotel have a swimming pool? Yes, the hotel has an outdoor swimming pool on level 1. Q11. What is the operating hour of the swimming pool? The swimming pool is opened daily from 7 am till 11pm. Is there a business center in your hotel & what are its operation hours? Yes, we do have a business center in our hotel & it is located in the lobby, next to the reception counter. The business center is opened 24 hours & facilities available at the business center includes printing, broadband internet access, PC usage, IDD, etc. Q13. Do your hotel have internet broadband facilities? Yes, we do have *internet broadband facilities in our hotel. For internet broadband access, please purchase the special internet broadband vouchers from the Front Desk cashiers’, which is opened 24 hours. Guests may use the computers at the business center for internet access if they did not bring along their own notebooks. *Hotel’s internet broadband facility is on wireless capability. Q14. What type of voltage do you have in your rooms? Q15. What type of multi-plug system do you have in your rooms? Q16. Do you have hair-dryers in your rooms? Yes, we do have hair-dryers in our rooms’ bathrooms. Q17. What is your hotel’s check-out time? Our hotel’s checkout time is at 12 noon daily. May I leave my luggages in the hotel even after I have checked out from my room? And whom do I approach? Yes, you may leave your luggages with our bellmen after your checkout. How do I make IDD calls from my room? Please dial ‘7’, followed by the country code, area code and the telephone numbers. The hotel’s telephone operator on duty will be happy to assist you in making the long distance call if you require any assistance. Where can you recommend some local delights or food & drinks during the wee hours of the morning? The hotel’s Trishaw Coffee House, which is opened 24-hours offers a wide choice of local and western delights. Located at the lobby level, the Trishaw Coffee House which is specially designed in Perankan style creates a very warm ambience, making dining in the outlet an unforgettable experience. 24 hours room service is also available for the guests who prefers dining in the comfort of their rooms. For the more adventurous, the Newton Food Centre is opened daily from 6.00pm till the wee hours of the morning. Walking distance from our hotel to the food center is about 10 minutes. Local delights such as the famous Satay, Chicken Rice, Chilli Crabs and other popular fares are available at the food center, just to name few. Which is the nearest subway station from Hotel Royal? The nearest subway station is the Novena MRT station. It is about 8 minutes walking distance from the hotel. Is shopping convenient from Hotel Royal & where can I buy the latest electronic and electrical devices and products? Yes, there are two main shopping malls within walking distance from our hotel. Novena Square, which is located within the Novena MRT station itself, and United Square Shopping Center, which is just across the road. For other popular shopping areas, we recommend shopping at the Orchard Road, as there are abundance of shopping arcades and the area is well-known as the Shoppers’Paradise. Travelling time from our hotel by vehicle to Orchard Road is just a 5 minutes’ drive. The subway (MRT) from the Novena MRT station can also bring you to the Orchard Road and you can alight at the Orchard MRT station. Other interesting shopping spots to explore would be the Chinatown, Little India, Bugis Junction, Raffles Place, just to name a few. All within easy reach of the subway from our hotel. For more details, please request for places of interest shown on the local maps from the hotel’s reception counter. The 2 most popular malls for sale of electronic and electrical products are Sim Lim Square Complex and The Funan IT Mall. Both shopping malls are conveniently located and houses the latest electronic and electrical devices and products. Which is the nearest hospital from your hotel? The nearest hospital would be the Tan Tock Seng Hospital, which is just 10 minutes drive from our hotel. What are the different modes of transportation of getting to your Hotel? Our hotel is conveniently located along Newton Road, which leads to the heart of the City, i.e. Orchard Road. SBS no: 143, 162, 124 and 54, which will bring you to all parts of Singapore, including Orchard Road (only 4 bus-stops away). The other transport alternative would be by the subways (MRT). The subway (MRT) stations are also linked to the Changi Airport and as well as to most parts of Singapore. MRT provides a very convenient mode of transportation to all parts of Singapore. Simple directional maps are available at all prominent points of the subway stations (MRT) to guide travellers to their desired destinations. The subway stations (MRT) are also manned to guide or assist travellers personally should the explanation of the subway (MRT) routes are required. The minimum cost of a ride on the subway (MRT) cost 70 cents for 3 station stops. The nearest subway (MRT) station located near to our hotel is the Novena MRT station, which is just 8 minutes walking distance from the hotel. Taxi is easily available at the entrance of Hotel Royal. The taxi fare is about S$20/- to the Changi Airport & travelling time is estimated to be about 25 minutes per way. The taxi ride is convenient and pleasant. As all taxis are equipped with a meter reader, you may request for a receipt from the driver upon reaching your destination. How do I go to Orchard Road? You may take a bus ride from service SBS no.54, 124, 143 and 162, the subway (MRT) from the Novena Station or take a taxi from the hotel’s entrance to Orchard Road, which is only about 5 minutes’ drive from our hotel. How do I get a taxi from the hotel? Please inform the bellmen to hail for a taxi and they would be pleased to do it for you. Alternatively, booking of taxi service is also available and can be done through the telephone operator. The cost of a taxi booking is S$4.20 in addition to the meter fare. Does your hotel provide transfer to the airport? Currently we do not have airport transfer service from airport to hotel and vice versa. However, taxis are easily available at the airport and also at the hotel’s entrance. Please approach the hotel’s bellman or reception staff for taxi service. How do I get from the airport to Hotel Royal? Please take the subways (MRT) (please refer to MRT website @ www.smrt.com.sg for more details) or take a taxi from the airport (estimated normal fare is below S$25/- per way). Q29. How long does it take to travel from the hotel to the airport? The normal traveling time to the airport is about 20 minutes. Q30. Which route should I take if I were to drive from Malaysia to your hotel? 1. BKE (Bukit Timah Expressway) towards the direction of the city. 2. After the BKE exit, travel by PIE (Pan-Island Expressway) & exit to Stevens Road. 3. Next, turn into Bukit Timah Road enroute Dunearn Road. 4. At the end of Bukit Timah Road turn left for Newton Road. 5. Travelling along this way, you will see Hotel Royal on the right side the road. Am I entitled to further discount if I made the reservation online? Special internet rates are displayed on our website for on-line reservation. I am working in a company known worldwide. Will I be extended with a corporate rate? Corporate room rates are also available for companies bookings and we would be pleased if you could leave us your email address and we will have our sales managers to contact you for our corporate rate package. Should I arrive earlier than expected, will I be given an early check-in? And what is the difference in price I should pay? Our hotel’s check-out time is at 12:00 noon daily and our early check-in will be at 3:00 pm daily. Early check-in is subjected to availability of the rooms. Full day rates applies to check-in before 7:00 am. Q34. Does your Hotel come with any parking facilities? Yes, our hotel provides free parking facilities for our house guests. I am driving a foreign vehicle into Singapore. Can I still park my vehicle in the hotel’s car park? Only Singapore registered vehicle are fitted with an IU unit, therefore foreign vehicles can purchase Autopass cards at the immigration checkpoint or you can simply purchase a Cash Card that is available at our hotel’s coffee-house cashiers’ at only S$7.00 with a stored value of S$5.00. How many car park lots does your hotel have? Our hotel provides an open space car park with very ample parking space. A total of 100 parking lots are available. I am your hotel guest. Will I still have to pay for the parking charges? All in house guests entitled for a complimentary parking coupon. Redeemption of car-park coupons can be done at the Front Desk Cashier’s counter 24 hours. What are the directions to your Hotel? Where can I exchange foreign currency in your hotel? You can have your currency changed conveniently at the Front Desk Cashier’s counter, which is opened 24 hours. Where can I find information on shopping areas in Singapore? Maps of Singapore are available at the Front Desk. On the maps, you may find many useful information like shopping centers, places of interest and many more tourists’ information. Should you have any problems, please approach our Front Desk staff or Bellmen on duty and they will provide you with the information that you need. Where can I get information about entertainment outlets in Singapore? What is the common language in Singapore? In Singapore English and Mandarin are commonly spoken. There shouldn’t be any problem asking for directions when you are on the streets as all Singaporeans are very friendly and approachable. Q43. Are slippers provided in the hotel room? Q44. Are toothbrush and toothpaste provided? Yes. We do provide toothbrush & toothpaste upon guest’s request. What time does the breakfast start and end? Breakfast is served at the Coffee House on the 1st floor. It starts from 6.30am till 10am. Q46. Can I make a late check out? Late check out is subjected to room availability. Where would you recommend some of the popular tourist attraction in Singapore? Getting there - The most convenient way to reach Jurong Bird Park is by taxi. Alternatively please take bus service 194 or 251 from Boon Lay subway (MRT) Station. Jurong bird Park boasts of 8000 birds from over 600 species, boggling the mind with creatures of all sizes & feathers. The world’s tallest man-made waterfall is famously found in a huge walk-in aviary. Another colossal enclosure has since been built with a high canopy board walk to admire flapping birds from Southeast Asia at eye level. Opening hours :- 8.00am to 6.00pm daily. Getting there - From Jurong Bird Park, take bus service no 251 to Boon Lay Bus station to Jurong East station and walk to the Science Centre. A new generation museum and repository of interactive scientific attractions, the Science Centre puts the wonderful joy of discovery front & center. Attractions include Amazing Electrons, Aviation, Dinosaurs, Chemistry, Human Body, The Mind’s Eye and Water Works. Altogether there are more than 750 audiovisual and interactive exhibits and many are simply mind blowing, especially for jaded adults. The grand old dame of gardens was begun in 1859. What surprises many is that, with its thousands of collected plant species and 52 ha of forest, it remains one of the world’s most important centers of botanical research. The Garden’s library and Herbarium alone has over 600,000 dried and preserved specimens. In the Gardens, large growths of shrubs, flowers and trees encircle a scenic eco-lake. Three zones with different attractions have been cultivated each dotted with visitor facilities. A very easy introduction to Southeast Asia’s natural heritage is available in the Rainforest Trail, where half of the species are very rare forest giants. The splendour of the national flower I son full display at the National Orchid Garden in the Botanic Gardens. Over 700 species and 2,100 hybrids are grown as far as the eye can see. The world’s largest orchid nursery has over 20,000 blooms. Getting there - Board bus service no. 162 from the bus stop opposite the hotel. Bus fare for this part of the journey will be $1.40. Transfer to bus service no. 138 and alight at Singapore Zoological Gardens. Bus fare will cost $1.50. The total bus journey will be approximately 75min. Alternatively, you can take the MRT (subway) down to Ang Mo Kio station and board bus service no. 138. Spread out over 28 hectares, it is home to some 3000 animals from hundreds of species of mammals, birds and reptiles. As many as 40 species are considered endangered, which is why there is much excitement when some of them give birth to healthy birth in captivity. Two predators often demand attention. The polar bears are the only ones kept in the tropics. The lions are not the only ones, but as usual the regal beasts look and act like they own everything. Other species are grouped with each other in peaceful coexistence. Still others can be spotted running around freely such as peacocks. The main attractions – Primate Kingdom, Wild Africa, Reptile Garden – are famous. There are always new themes being prepared. A well-rounded experience is given by the many animal shows; up to four a day now, and the petting facilities, which lets you, get in touch to sea lions. A regular tram service toots around the zoo but the seats are always taken, it seems. The 40 hectare safari area, also managed by the zoo, takes advantage of a stable climate to place animals in outdoor rainforest without, at night, visible barriers between species. Predators and herbivores alike, some 1000 in total, can be seen behaving to their instincts – stalking, killing, courtship. A 45-minute tram journey under moonlight conditions slinks through “regions” like Nepal, Africa, Burma or South America, On foot, follow the trails that stab into the darkness and skirt all enclosures. There is no obvious barricade and the animals can get very close, which is why the Night Safari is a stunning attraction. Getting there - The journey by bus (SBS service no 143) from our hotel to the Sentosa Island is about 30 minutes. Please visit SMRT website @ www.smrt.com.sg for fare prices to & from hotel to Sentosa & vice versa. However, you would have to change to another bus service at the HarbourFront Bus Interchange (look for “Sentosa Bus” display on the bus). The bus fare is S$3.00 from the HarbourFront Centre to the Sentosa Island. The subway from the Novena MRT station will also bring you to the HarbourFront Centre*. The HarbourFront Centre is located just across the Sentosa Island and is linked to the island by a bridge. Cable car service is also available at the HarbourFront Centre to the Sentosa Island. From January 2007, visitors to the Sentosa Island can hop on the Sentosa Express, an 8 minute train ride to the island. Visitors can board the train at VivoCity, which is connected to the HarbourFront MRTstation. The fare costs S$3.00 for the monorail loop service. Tickets to the Sentosa’s attractions will start from S$30/-. The express has 2 stops, Imbiah Station and Beach Station. From there, visitors can board beach trams and inter-island buses. Sentosa is turning into a very exciting place indeed for visitors. Promoted as Singapore’s discovery island, there are great plans in store to turn it into Asia’s prime resort estate. Today, it is well worth a visit with museums, parks, golf courses, restaurants and hotels, reinvigorated from billions spent. The most unique way to make the 2km trip to Sentosa is by cable car from Mount Faber or Harbourfront Centre, which takes 12 minutes of floating at 60 m above sea level. Here you can enjoy the scenery of much of the southern coast and marvel at how much of Sentosa remains deep green woodland. Alternatively, a causeway has been built for easy access back and fro. Getting there- Board bus service no. 124 at Hotel Royal. Alight at North Bridge Road in front of St. Andrew's Cathedral. Walk to Asian Civilisations Museum, which is situated opposite the Adelphi. The bus fare is approximately $1.10. The most dramatic museum in Singapore is housed in the historic Empress Place Building, constructed in the 1860s as a courthouse. The ten galleries feature different regions with their own timelines and permanent displays, of which several, such as the Buddhist-Hindu gallery simply stunning. Over three levels of artifacts and priceless pieces await the awed visitor.